Do you know what is a good way to enjoy your time off from work? Playing video games, its a great stress reliever. I think you can never be too old for video games. Did you know that its even better to play games using a great entertainment system that’s modified to make your gaming system turn into a home arcade for fun and excitement? This is one of the many reasons you should own a Samsung home theater system. 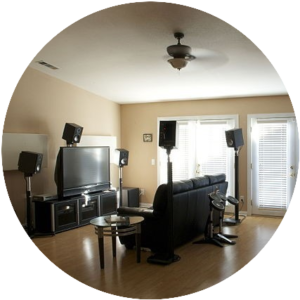 This system has the most fun filled technology you can ever want in a home theater system. Were going to look into the specifics of this system plus check out new opportunities you can use to elevate the way you live your life at home. We also have options to choose from for the way this set is ulitized. This will give you more ideas to expand the entertainment value in your home. Let’s first talk about the type of systems Samsung offers you. Ever imagined what real motion and high contrast looks like? then check out Samsung’s QLED UHD 4k Smart TV. I promise you this will blow you away on quality, technology and entertainment. I have been impressed by the features this flat screen has brought to the table. Watch movies in ultra-high resolution beyond what you normally view, be amazed by dazzling colors to enhance your view of watching television and sit back to enjoy the smooth auto adjusting contrast from the darkest blacks to the brightest white scenes. This is no joke of a smart TV, you get the real deal in entertainment. Just wait till you read about the features of this model. Q engine: which optimizes content to its fullest extent to deliver more then just clarity, its powers real time motion and 3-D effects using a smart chip technology. Q Color: Not only will you have a good HD display, Samsung shows more color shades, about a BILLION more! That’s like putting on 3D glasses to witness the images coming at you but with mind blowing colors. Q HDR: This Is High Dynamic Range at its best. This is what makes the contrast explode to brilliant displays in the dark or in the light. Q Smart: What I love about this part is the effortless ability to find all of the streaming shows and videos by using the voice command feature called Bixby Voice Remote, which comes with the Samsung flat screen. This alone should get you excited. Q Contrast: It’s all about the depth and sharpness of viewing live TV or great movies that has some distortion due to age or over use. you really see this difference compared to a regular smart TV. Samsung puts the power back into your hands by packaging way more features to enjoy your time while relaxing at home. Ambient Mode: This is cool Feature when you not use this flat screen. This Smart TV blends its self into your living room by displaying images in a low or high ambient visual. It’s like viewing a large picture on the wall. Ultra Thin design: helps this set look smooth and sleek, which is great for blend into your living room set. Trust me, you will love the way this flat screen blends or even improves the look of your home. Universal Guide: that’s built in. No more boring shows to only watch when you have the power of streaming by your side to find all the shows and movies to watch by the press of a button. You Can Display personal photos on this set with amazing colors and high resolution when your not watching TV. Think of it as large Family photo album with better displays. Are you worried about the extra cables running though your house? don’t worry about that when it comes to the QLED TV, you have a nice cable hook up that will make it look totally professional and hidden. It’s a whole new way to live at home. The chance to catch up with the family in many ways that doesn’t seem to drive them away is most important to know for sure. Samsung delivers most of your entertainment though the use of many options but in a better format. If its karaoke night, use Samsung to show videos for high end display while you following along to the music. Maybe you would rather prefer to watch videos in live TV, its great to see it like you are there at the event. Join your friends for a round of gaming that will keep you fully engaged by its features all night. You will never go back to the old way of playing video games after experience the power of QLED. Having this model around your home can not only improve the quality of life it can save you on the energy cost as well. No more wondering how are you going to log in smaller time periods to accommodate using energy at a low rate. This uses less power than your average TV set could offer. Now that we covered the Q6 set but what about the Sound system you haven’t heard of yet? combining this to the TV set is like a ONE-TWO punch in theater system entertainment. Let’s take a look at a surround sound system to complement your viewing. Samsung Premium Sound bar has The world on its ear when this device is on and preforming at its best. Just when you thought it could not get any better than the Q6 just open your ears to a whole new different sound that has room filling sound and it all comes from a slim sleek piece of rectangular bar design to be in capacious yet rock the room your watching TV or listen to music in. Samsung Sub-woofer This is a marriage made in heaven, You can bet this sub-woofer makes the whole surround sound system complete. You could think of this as the hot fudge to ice cream. This sub-woofer makes the room shake and blast out more than just a bass sound, its ROCKS your core with cinema sound and theater clarity. Imagine 72 hertz of bass pounding every action scene. You can get 700 watts of edge of the seat thrills to fully keep your attention while delivering good wholesome sound. The best part about the sub-woofer is that wireless technology, you can place anywhere around the room to receive the best quality sound you could use. Samsung home theater system has all what you need to fully engage yourself into an another place, It’s great to get the family together for evening of joy, laughter, and excitement. Buying a Samsung theater system requires little to no setup involved to have the ideal system for your guest in no time. People have different perspectives to using a Samsung home theater system, Mine is video gaming with friends which is what I use mine for. But I encourage you to take a full look for your self at this wonderful system and give it a try. It’s well worth its weight in gold. It’s delivers nothing short of a good time and a worthwhile opportunity in great amazing performance. If your looking to find out more about Samsung’s Home theater system with a good break down in specifics, I would fully recommend checking it out on Amazon for starters. It’s one the best places to really get a wonderful deal. Please comment and share with us your ideas for entertainment by comment below this article. We truly value your opinions.